2 What Constitutes an Old Cookbook? Moving back in time, pre-WWII cookbooks are especially interesting because they utilize extremely low, cost, depression-era ingredients. In addition, they emphasize the use of home-grown vegetables to supplement the meager fare that was available at the time. Although published in modern times, my favorite depression-era cookbook is Clara’s Kitchen which I reviewed in the article Depression Cooking: A Visit to Clara’s Kitchen. The Feeding America project has created an online collection of some of the most important and influential American cookbooks from the late 18th to early 20th century. The digital archive includes page images of 76 cookbooks from the MSU Library’s collection as well as searchable full-text transcriptions. This site also features a glossary of cookery terms and multidimensional images of antique cooking implements from the collections of the MSU Museum. Bargain Bin: If you are like me and believe there is a possibility that things will be going to heck, you may want to consider some of the items that are in today’s bargain bin. Lodge Pre-Seasoned Cast-Iron Skillet with Red Silicone Hot Handle Holder, 12-inch: A cast iron skillet will serve you well if you are required to cook outdoors because the grid is down. Once you have a cast iron skillet, you will use it for everything, indoors or out. Artisan Bread in Five Minutes a Day: The Discovery That Revolutionizes Home Baking : At an average cost of 50 cents a loaf, this bread is easy, delicious and inexpensive to make. Making your own bread is a skill everyone should have. RAVPower 15W Solar Charger with Dual USB Ports: This compact, three panel, solar charger will charge two devices at once, including tablets, smartphones, Kindles, and even AA/AAA battery chargers. Value priced at about $50. RAVPower® 3rd Gen Deluxe 15000mAh External Battery: Use the sun to power an external battery pack. By doing so, you will always have battery power to spare without being dependent upon electricity. Perfect to have on hand for dark, stormy days, night time, or when you don’t have the time to wait around for a full charge in the sun. Holding Your Ground: Preparing for Defense if it All Falls Apart: This book, by Joe Nobody, is the book you that will teach you how to defend your your homestead in the event of civil unrest or a collapse. Great article, thank you. I have my Mothers old cookbook. It’s what I grew up with and learned how to cook with. I am 60 years old and this book was old when I was a kid. IN my memory it has never had a front or back cover and is missing several pages because the binding is long gone. It tells you not only how to cook, but also butcher, smoke meat, brine and any other thing you might want to learn. It is a very thick book and worth nothing except to me and to me it is priceless. I wish I could find out what cookbook it was so I could have it restored. Oh well I will treasure it for what it is. Suni, I take it that it doesn’t have a title page either. If I may, take it to a book binder or printing company. Also print out your story, then have the printing company include your story with the cookbook. I know it will lower the monetary value, but will increase the value for anyone else who gets it after you. Whoever gets it will receive a rich blessing of memories. Cookbooks from pre-factory days also include instructions for ingredients that we don’t tend to think about these days–like how to use pearl ash (white ashes from the fireplace–very alkaline) in place of baking soda. Civil War cookbooks, especially from the South, tell you how to make a variety of coffee substitutes, along with other substitutions of goods that would typically be shipped in. These substitutions could come in very handy if TSHTF! When I was growing up, my mom used a cookbook called the Household Searchlight; I believe it was from the 1930’s or 1940’s. I figured I might have to flip a coin for it when my mom passes on; she rarely uses it anymore but none of her girls (I have 2 sisters) have taken it yet. A few years back, I was in a used bookstore and a book fell off the shelf and hit me in the head–and it was the Household Searchlight! I know I was meant to find it! So as least we will have one less “who gets what” decision to make later in life! Had my mother’s but gave it to my oldest daughter. Found another on eBay so I am a happy camper! Gaye, love your website. I also have the Betty Crocker 1969 cookbook, given to me as a wedding present 40 years ago. It got so worn I spent several hours taking it apart, page by page, punched holes in the pages and put it in a three ring binder. I love this cookbook that much!!! I am intrigued by the Lydia Child book, will look into that one. Thank you for your efforts in keeping us informed! I’m lucky to have my grandmothers and great-grandmothers cook books. While everything you mentioned are in them, there is a special addition of notes written in margins, in my grandmothers handwriting. Tips and tricks for the family favorites. A couple are even scratched out with the notation “do not use this recipie” and “terrible” which made me smile. There are other tips like “use a pinch of this instead of a pinch of that”. And my favorite, “cut the worm holes out of the apples and don’t use more than 4 logs at a time or you will burn the apple butter”. I would recommend the series of books by World Community Cookbook. There are 3 cookbooks that have been in print for over 30 years:More-With-Less Cookbook, Simply in Season and Extending the Table. They are published in “cooperation with Mennonite Central Committee, a worldwide ministry of relief, development, and peace” I like the message they have that you can eat well with less and the large variety of recipes – many from missionaries that have served overseas, that have an international flavor on an budget. LOVE old cookbooks. I have several that I cherish. One I especially love was given to me by my husband while he was working at a publishing company in Lincoln Nebraska. It is the Nebraska Centennial cookbook and has some old pioneer recipes in it as well as favorites from previous Nebraska Governors and other politicians. Lots of great recipes and great ideas for making things stretch. I also have several old Watkins cookbooks from the pre World War II era. Love them! If you can find a copy of a cookbook from the Victory Garden era it would be perfect for your use. Those books had not only information about what to plant but how to use the produce as well as how to can and preserve it. I love old cookbooks. I would recommend The Joy of cooking- if you only had one cookbook, this should be it. Also, the Foxfire books offer many old time recipes as well as all manner of knowledge concerning how things were done in bygone times. Love my old Julia Child cookbooks, and the Galloping Gourmet. Does anybody remember him?? Maybe I am aging myself! I found an old cookbook at a garage sale simply titled Beans. It has tons of really useful beans dishes and breads and desserts made out of beans. I never knew before this that you could make flour from beans! I remember the Galloping Gourmet. He taught me how to “cook” with wine. LOL. Seriously, he was as entertaining as he was interesting.I have a few of his recipes written down somewhere. What a great idea. Sounds like a great idea even now, as I’m trying to learn to cook from storage food. Thank you for including the link – I just downloaded the pdf of The Frugal Housewife. In addition to great advice and long forgotten techniques, I appreciate the glimpse into the life and times of these women. Not so long ago they were doing so much more in their average day, without the use of “modern” appliances, and usually in long sleeves and longer skirts with no a/c, and in some instances, no running water. Every time I read one of these books I have a new measure of respect for the remarkable women of generations past. This is a fantastic post. My wife and I use the original Fanny Farmer along with several hand-me-downs from our parents and we use index cards for our favorite old-time traditional recipes. Will certainly be looking at the Frugal Housewife. Thanks! Cathy, I am intrigued by your story of living in the woods for a year. Something I only dream about. Would love to hear more. Karen S.
Karen S…While I learned so much about myself, what I could really do, that was not a good time. I had my boys and a (now ex)husband, and it was a constant work load for me to see the boys were warm in the snow, fed with a campfire made of wet wood, got homework done by candle light, while hubby sat on widening rear end and did not get house put up. Finally the boys and I started in, in Oct to build a cabin,,,and it did stand up to the snow. I did not know how to put in a floor so I laid down wet sheets, the carpet pieces. It worked. We were quite a ways from the nearest power line, and with small children I do not recommend oil lamps. I used candles which I made. I milked my cow, and tied her to the tree by the door of the tarp tent, and by spring I had a shelter up for her when the calf was born. Had a few chickens, and they roosted in the trees. They moved into the cow shelter. I cooked on a campfire. Hung a beef in the tree by the door in Dec and it froze solid, used a hatchet to chop of pieces for stew. All in all the boys thought it was fun. They are now 52, 49 and 47. And I learned I could do it. No one can tell me different! I am now almost 72. Today I cut 5 wheelbarrows of firewood using a battery run electric saw! Cathy, thank you so much for sharing your story. It does sound very difficult, especially with a partner who is not pulling their weight. 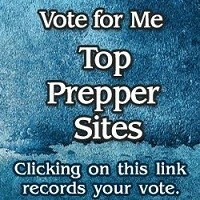 God forbid SHTF you are already ready! Thanks so much for the free links. I’ve been looking for old recipes (scratch recipes) and have a hard time finding them. I’d much rather have a from scratch recipe than an updated, so called better for you recipe, that uses canned and packaged food. I’m not fussy on the butter, sugar and salt substitutes either, because I believe they’re less healthy. I have the recipe book that I learned to cook with, around 1965, the one my mom used, but need to replace it because it’s so worn. I hope I can order one and that it hasn’t been updated because mine is from scratch and that’s what I want. You might also check out Lehmans.com they are one of the main suppliers to the Amish communities and others who live off grid. They not only offer non electric items but also many cookbooks and how to books on homesteading, butchering and other items of interest to preppers. Does anyone have a substitute for baking powder should a collapse last longer the what my baking powder expiration date says? Not long after that date, it no longer rises…so if sourdough isn’t palatable to family, you’re tired of tortillas, what’s the alternative? Couple of things: not all sourdoughs have a tangy taste. As a matter of fact, it takes work to get them that way. Still, sourdough is tricky to use plus, the constant feeding uses up flour resources. I need to work with sourdough more before I will be 100% comfortable with it. Definitely on my prep-skill to do list. I believe the stated shelf life of baking powder packaged by food storage companies is 5 years. I agree that old cookbooks are important. I’ve been collecting them for years (I’m 77) and I almost laughed at the idea that they would not be worth keeping. They are certainly interesting to read, even if you aren’t cooking from them. thank you for th e links!1 I have them printing as i type!! they are going in to a binder i have set up for just such things! I have several old cookbooks and what I like is they make no assumption about your skill level. I have a 1972 Farm Journal cookbook that has instructions for building a BBQ pit (for a crowd) and how to make butter. I have several versions of the Betty Crocker cookbook with sections on how to choose a cut of meat, what cuts should be roasted, fried, braised, etc. Some have substitution/equivalency charts that are very helpful. I live in a 23 foot camper. Space is always at a premium. The cookbooks will always have a place. I still have the Betty Crocker Cookbook I purchased before I was married in the 70s. It is held together by tape due to years of use and abuse. I like that the methods do not rely on microwaves or other modern gadgets. On the other hand, processed food was in its heyday as was the use of margarine so adjustments still need to be made. one of the greatest advantages of owning an old cookbook; and I have one copyrighted in 1938, is the personal notes, handwritten recipes or newspaper clippings of the past. My fondest example is my mother in law’s handwritten recipe for homemade ice cream. I have two old cookbooks with yellowing pages! Love Them! i agree about the information-how to choose meats, cut, cook! the measurement explanations are priceless. How to set a table and entertain…i could go on and on! We loose so much by not looking back to how our grandmothers provided meals for their families!! Teaching my daughters the way to cook! I’m really enjoying reading through all your blogs. I grew up on a farm learning how to use herbs, vegetables, weeds as medicine and food. We butchered our beef, sheep and chickens as well as hunted wild game. When I moved away at 17 I thought I wanted to be a “City girl” instead and spent the next 15 or 20 years that way. Over the last ten years I’ve been going back to my roots with sustainability and I’ve been prepping as well as apartment homesteading. I cook everything from scratch, make my own medicines, tinctures and extracts. I make soap, organic insecticides and DIY or Repurpose everything. Most of my food recipes come from old recipe books and google searches. But when it comes to learning or re-learning a homesteading tradition I would be lost without a book I found it the thrift store for a couple of dollars. It’s Carla Emery’s Old Fashioned Recipe Book: An Encyclopedia of Country Living. She and her Husband started homesteading between the late 60’s and early 70’s. You can find everything in there from making cheese, sourdough starts, to building ovens, dressing game or livestock. There are thousands of practical recipes for everything. Plus everything you need to know about homesteading. I use it often. There’s a wealth of knowledge and almost everyone could find something in there that pertains to them or their needs. You can find several of her books on Amazon. Some of the words they used were very different. I had to read one section five times over before I figured out what forcemeat was. I’ve been a cook-book nut for years and have a room full of old cook books. I’ve seen some books with missing binders and covers, but the wealth of knowledge in them was worth the time to make a new cover. I sure enjoy the many recipes from them and always find a tip or tidbit I didn’t know. They can come in handy when you need to save money or have good holiday meal and impress family and friends. Keep up the great work. Thanks for making me smile today!!! My mom had a cookbook for Pioneers heading west it showed how to make gunpowder birth a baby using the grease under the wagon and what to check for if the babies having problems coming out and all kinds of neat interesting things and it had old ads of what to take.